What's going on with Xmarks for Firefox? 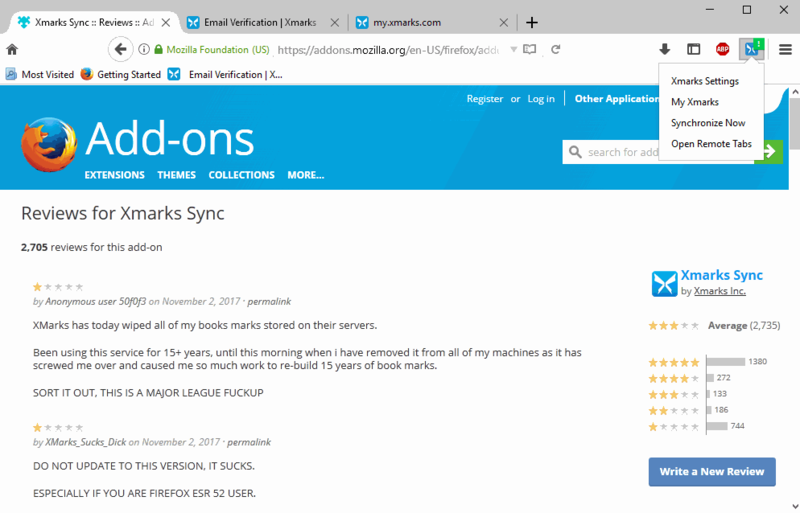 Xmarks, once a popular solution to sync bookmarks between different devices, is not working correctly anymore for many users of the service. Xmarks (formerly known as Foxmarks) was released as a Firefox add-on back when Firefox did not support its own data synchronization service. It filled a gap at that time by allowing Firefox users to sync bookmarks between different devices. The company was acquired by LastPass, makers of the popular password management service, in 2010. Development of Xmarks continued, and new versions were released regularly by the new owner of the service. While LastPass has been busy porting the Firefox add-on of the password manager to the WebExtensions standard, Xmark development continued as well. The extension was released as a WebExtensions version in October 2017, and is compatible with Firefox 57 and newer because of that. Ratings for the browser extension tanked significantly in the past couple of weeks though on AMO; the average rating is three out of five stars, and the first couple of pages of user reviews give the extension a one star rating (the lowest rating possible). Bookmarking syncing is buggy. Sync does not complete all the time, and some users report that the process deleted some or even all of their bookmarks. Separates are not synced anymore, and some users report that bookmark duplicates are created during sync. Some features like history syncing, shortcuts were removed. Extension prompts for login data frequently. Coincidentally, the Chrome extension received several one star ratings as well recently, but not nearly as much as the Firefox version received. The developers have not responded to user inquiries, and the last blog post dates back to 2014. The WebExtensions version of Xmarks seems to be the root cause of the issues that users are reporting. It is unclear if and when a new version will be released that will address these issues. Xmarks users should backup their bookmarks on the local system right now to avoid any bookmark syncing issues caused by the browser extension. Firefox users can use the shortcut Ctrl-Shift-B to open the bookmarks manager. Select Import and Backup > Export Bookmarks to HTML. Select a name and location for the bookmarks file. This stores a HTML file with all bookmarks on the local system. You can import the file at a later point in time in Firefox and many other browsers. Firefox 56.x and Firefox ESR users should consider installing the previous version of Xmarks for the time being. Note that it won't work anymore when Firefox 57 is released next week (will continue to work in Firefox ESR until next year). Another option that Firefox uses have is to switch to Mozilla's own syncing service. This works only if Firefox is used exclusively. Now You: Do you sync bookmarks across devices? Mozilla did a very bad risk assessment on abandon legacy extension. Meanwhile, I am sitting it out, using Waterfox. It’s time to rip the bandaid off, legacy extensions were holding back firefox development for too long. I always save the complete profile regularly. After re-install of Windows and Firefox i use profilemanager (Firefox.exe -p) to remove default profile and create my personal (always same name on a secondary drive/partition) start FF once and then close FF and copy all the saved profile back to the profile. All settings, addons, themes and bookmarks are back. I see no need of any sync addon/service at all. Never sync I just save as html file and keep a copy on a flash drive. An regularly keep it updated, some are many years old. Similar issues have appeared in the last days to the Chrome Xmarks extension. In my case it constantly produced sync error notifications and advised to download bookmarks copy from a server. Once done, there were no bookmarks on the server nor on my device… The good thing is that Xmarks creates backups itself and they were untouched. I want to dump Firefox as quickly as possible with the debacle Mozilla have caused with the reversion to WebExtensions and use Waterfox, Palemoon or Light but I have all my passwords on Dashlane which only works on Firefox, Chrome, IE, Safari. Yes, I know I can switch to LastPass or Keeppass but IMO, Dashlane is simply the best password manager that I can use on my iPad, iPhone, Laptop, PC and works flawlessly. It used to work on Waterfox, Light, Palemoon but then an update 18 months ago, stopped this and now Dashlane deny it ever worked on these other browsers (all Firefox based)!! There is probably some way that it can be changed to work but I aint that smart & Dashlane refuse to help. You can’t force Dashlane to run, especially if the developers themselves refuse to provide compatibility. I wouldn’t try strange workarounds with a program that holds my passwords. You can only try password managers that support all the systems you want. Sticky Password is a good alternative (you can find a lot of discounts, including here on gHacks) and it does support several OS’s and browsers including Pale Moon (x86 version only, hopefully they’ll add support for the x64 too). You can also import your Dashlane data. SP is not perfect of course but it does the job and it’s safe. Since I updated to version 4.5.0.4 (stable, not beta), it’s been good. Their servers were going through a bad time last week, but I haven’t had issues since last Friday. I recommend to stay away from latest version 4.5.0.4 (if possible). I reverted to previous version 4.4.1 which works perfectly (now that they have sorted out their server problems). I use it across devices with Cyberfox, Waterfox and SRWare Iron (all x64 editions) with no issue. Thanks for writing about this, Martin. I’d noticed that something hinky was happening with Xmarks in Firefox and Firefox ESR, but I didn’t have time to look into it. I’ve been using Xmarks to sync history only between Pale Moon, Firefox, and Firefox ESR. Version 4.4.1 (the latest version supported in Pale Moon, apparently) still seems to work okay between different installs of Pale Moon, and I just downgraded to that version in my other Firefox-family browsers (just barely remembering to turn off automatic extension updating for Xmarks). If all goes well, I’ll get a couple extra weeks of aggregated browsing history in mainstream Firefox and seven extra months in Firefox ESR. Hooray. By the way, I’m kind of looking forward to seeing how many casual users who don’t pay attention to tech news or application messages but who’ve been relying on legacy extensions for years — maybe because a friend or relative installed them — freak out when their Firefox suddenly stops working the way it used to. I guess we won’t really know, because that kind of user tends not to post on tech blogs or forums. Maybe they’ll complain on Facebook or Twitter or something, and that will in turn get reported in the tech blogs and forums. I had a major issue with Xmarks a couple months back where it wouldn’t sync for a couple days so I started looking for alternatives. One I found was Bookmark OS which comes in a free version and a pay version. You can find it at https://bookmarkos.com/ Your bookmarks live on the web rather than on your computer so they are compatible with all browsers. And it has an extension to add more. While the pay version doesn’t allow nested folders if you already had nested folders you can add more bookmarks to those. I haven’t fully moved over yet but likely when renewal comes next year I will stop paying and move over. The author is very friendly and answers questions fairly quickly. I have really enjoyed using Xmarks but it does indeed have many quirks. Don’t forget to use FEBE to keep regular backups of everything including complete profile. I have years of backups that have allowed me to use older themes or extensions that aren’t even available from Mozilla anymore when tinkering with Palemoon. Unfortunately FEBE is another extension that won’t get ported. I simply keep backups of the firefox profile folders (included in my disc images backups). Xmarks has been thrown under the bus. Development im sure has all but stop. Ive been actively looking for a new service with similar feature sets for multi/cross browser support. Raindrop.io has been interesting but lacks speed that xmarks has. Very fast and similar to Xmarks (also works on different browsers across various devices) . Yep was using too and had a hard time finding info about the progress of development ! Before testing Firefox Sync with bookmarks, I’d like things to be more reliable with extensions. Mozilla bug 1234400 – Investigate failures to sync addons. I love FF, but Xmarks has been a complete mess for some time now. As such, I had to switch to Google Chrome (which I’m not a fan of). But, man! Even LastPass (same company) has a buggy extension for FF56/57 and doesn’t save my credentials, even though it’s set to. Used to pay for their premium service but whenever I had an issue (maybe a total of one or two emails), never got an email back from support at all. Stopped paying after that. My guess is clearly they are either having developer issues or they’re going under. After reading the posts here, I think I’ll just start exporting to HTML and going from there. I don’t expect it to work much longer and more worried about LastPass as well! Shame – used to be a great product, but seems like total crap now. Just my observations. Saw that Xmarks was broken in Firefox Quantum for a time, but it’s working at least as of update released this morning. This is on Mac, for Firefox 57.0.1 (64-bit) and Xmarks 4.5.0.8.
however it is clearly not quality tested, as for example the Profile cannot be listed and selected. I think their problem is thay refuse to recieve bug reports by non premium users. you pay testers to do that. and you don’t test on premium users. I have to say FF Sync is seemingly useless. I copied the exact backup file to two computers. I deleted folders on computer B, hit sync, and they just came right back…because (I’m assuming) they were still on computer A. What the hell good is that? What am I missing? Xmarks please fix your app…we’re dying here. Xmarks sync is broken since new Firefox webextensions version. Everytime I cross sync on a Linux machine from a Windows one it duplicates bookmarks. They claim I have another sync service (I don’t even have a Firefox account). Many time the server crashes with a timeout or a server busy or internal server error. They also ask for you not enable automatic sync so there is no two machines syncing together. I know the new webextensions addons is limiting but the service itself got not deserving to pay for anymore. We see a steady declining since LastPass acquired Xmarks, and fortunately I never even thought of saving my passwords on a single basket and LastPass leakage of passwords a few months ago showed I was right. I’m an xmark users for many years, 2 days ago when when sync it wiped out all the bookmarks in Firefox ( one in a win10 and the other opensuse leap 42.3). Mybookmarks are OK but I can not download them from the server. My solution has been to Export from My bookmarks then open the bookmark manager in firefox (Ctrl +Shift B) and import the file here. The toolbar book marks comes as a folder of the main main bookmarks so I have select all of them and move them to the main toolbar bookmarks. Of course I unchecked automatic sync in Xmarks. After having a lot of troubles and loosing some bookmarks last year during the mismanaged change to FF57 I only use upload from my main-computer with xmarks 4.5.0.8 and download manually on other device. But since last week no upload works. No answers of support since 3 days for premium clients!!!! Always used XMark. Great addon (used of my own server to sync all my devices) !!! Up to v4.4.1 after that i’ve abandon XMarks !!! Hope other clever programmers will create a similar add or prog and all old Xmark users will use that. It really seems like it was abandoned, and it’s not only a firefox issue. Even restoring old backups from the web interface is a hit and miss. Mostly it doesn’t work. The seems the be a problem with the xmarks backend database. Thanks for this suggestion. Instead, I just created a new account on XMarks, which gave me a completely fresh server-side database. I then logged in to that new account with the browser extension, it synced up in a jiffy, and all my Firefox bookmarks are now in the server database. Whether this will work long term–or even short term–remains to be seen, but the idea of starting with a fresh server-side database just makes a lot of good common sense. Thanks for that update Manfred. I wonder how those steps should change if the user has two different profiles that they use, one for work and one for personal. So in this case I don’t have a single chrome/browser that has all my bookmarks at once. The writing is on the wall… Lastpass no longer offers a bundle, they have doubled their price for the password service and Xmarks is messed up. I suspect there has been a falling out and xmarks will be sold or left to die. Terribly sad since Xmarks WAS a great product. Perhaps after being acquired, the CEO just was interested in one direction only, unable to be diverse enough to work on both products. Someone will take over that sector and Xmarks will just go away. They obviously have some coder problems. It used to work fine (for years). The ugly stepchild of Lastpass. That is a reflection of LP. Nutty marketing with LP. Not sure what is going on “upstairs” (sniff sniff) as in tears of course! I ended up switching to https://www.everhelper.me/synchronizer.php (as throkr above mentioned). It’s been great. Thanks mihai for posting that. I got the same email, so figured anyone else who has used Xmarks would have gotten it also. So there it is. Time to look for new bookmark solutions (if you hadn’t already been looking!) GL all! I work at Siber Systems makers of RoboForm password manager. Just wanted to leave a note here as well that RoboForm has always supported cross platform/cross browser sync of bookmarks and is a great alternative to Xmarks. We have instructions on importing for both Windows and Mac over at our Help Center. RoboForm seem to be making an offer to XMarks users for an annual subscription. There is an opportunity here for Firefox to make amends to millions of users who suffered badly by the introduction of Quantum. A good browser should be able to offer a bookmarking service for users. Firefox should now take over XMarks. Any talk of anyone else interested in making a bid?